Baptists have a long and rich heritage of congregational song. The hymns Baptists have sung and the books from which they have sung them have been shaping forces for the theology, worship, and piety of the denomination. Baptist authors and composers have provided songs that have made an impact not only among Baptists in America but also across denominational and geographic lines. Congregational singing continues to be a key component of Baptist worship in the twenty-first century. Beginning with an overview of the British background, this book is a survey of the history of Baptist hymnody in America from denominational beginnings in the New World to the present. Its intent is to help the reader better understand the background against which current Baptist congregational song practices operate. Unlike earlier writings on the subject, this book provides both comprehensive coverage and a continuous narrative. It gives thorough attention to the major Baptist bodies in America as well as calling attention to the contributions of significant smaller groups. The British Baptist background is dealt with in an introductory section. The book also includes many texts and tunes as illustrations of the topics being discussed and focuses on some of the contributions of Baptist authors and composers to the repertory of congregational song. 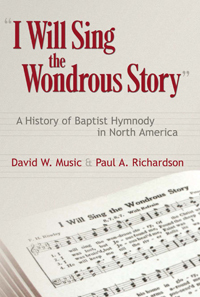 I Will Sing the Wondrous Story: A History of Baptist Hymnody in North America provides a fine history of Baptist hymnody, starting with a review of the British roots and following its evolution in America from New World origins to modern day. Readers receive a fine review of the social and spiritual contexts under which Baptist congregational song evolved, offering a survey of texts and tunes as illustrations of topics and including insights on major contributions by Baptist composers. Any collection strong in spiritual music insights will consider this a winner!